Bake an eight inch round two-layer cake. Ice it in white buttercream icing. Make a shell border on the top and bottom of the cake using white icing and star tip, size #18. With brown icing and basketweave tip, size #48, make two strips with the sides touching to make the boards randomly on the sides of the cake with some on top. Be sure to save room for your message. With white icing and round tip, size #5, make two dots on each end of the boards. These represent the nails. Then scatter miniature saws and tools on top. These can be purchased at a craft store. With brown icing and round tip, size #5, write your message on top. Bake an eight inch round two-layer cake. Frost it with white buttercream icing. With white icing and star tip, size #18, make a shell border on the top and bottom of the side of the cake. Place a miniature mail box and miniature packages on the top. These may be purchased at a craft store. The green grass is green sugar sprinkled around the mail box. Put a tablespoon of sugar in a baggie and a couple of drops of green food coloring. Seal the baggie and squeeze it until the sugar is green. 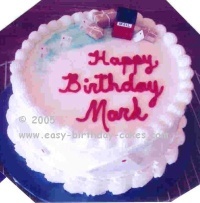 To make the letters for the sides of the cake, cut six rectangles 2 inches x 3 inches. Make squiggle lines for address and return address. Make large red dot for stamp. Then laminate them with self stick laminate on both sides. Stick them on the sides of the cake with a little bit of icing putting them at an angle. 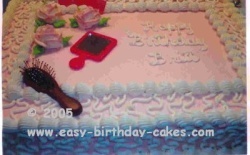 Write your message on the top of the cake with round tip, size #5 and red icing. Bake a sheet cake in the size that you need. Ice the cake in pink buttercream icing. Using an icing spatula to smooth it on. Using white icing and round tip size #5, do lace work over the pink icing on the sides and frame area on the top of the cake as shown in the picture. Next do the shell border along the inside of the frame, top edge, and bottom of sides using white icing and a star tip size #18. Place three roses in the corner. To make the roses, use pink icing and rose tip #127. The leaves are made with green icing and leaf tip #366. Next, write the message in white icing and round tip size #5. 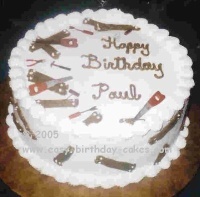 Finally, place the miniature items such as a mirror, comb brush or small pair of scissors on the cake. These birthday cake decorating ideas can be adapted for any profession. They would also make great retirement cakes as well.